The national debate surrounding Confederate monuments came home for the city of Knoxville this past weekend. A planned rally took place in the city in support of a local monument dedicated to Confederate soldiers who died at the Battle of Fort Sanders. According to local news affiliate the Knoxville News Sentinel, the rally was relatively peaceful with no violence, one arrest, and a lot of shouting. A source (yes, I’m being vague, get over it) told me that the event was first advertised on Stormfront, a white supremacist website, and that the organizer has ties to Christian Identity Groups and Neo-Nazis. Some members of the counter protest showed up with an ANTIFA banner but there was not any sign of black masks or assaults. Arguments on both sides of the Knoxville rally mirrored those taking place on the national stage: one side arguing that the monuments are about history or heritage, and commemoration of those who served and died; the other side arguing that the monuments represent white supremacy, Jim Crow, and a narrative that lies about the war and the people involved. In the case of Fort Sanders the obscurity of the battle, and even more-so the monument’s dedication, obfuscates the context of the monument. With context lacking, the monument is up for a wide array of interpretations. I have a personal interest in the Fort Sanders monument as opposed to my views on many of the monuments currently in the cross-hairs of debate. The reason for my interest is that I participated in Fort Sanders Civil War Re-enactments and Living Histories on numerous occasions over the past few years. Those events speak volumes in terms of commemorating the past but that’s a post in and of itself. That’s me to the bottom left. Long live the Union. Huzzah! For a little context and history of the battle, check out the National Park Service’s Battle Summary on Fort Sanders. Another good source is the McClung Museum of National History and Culture’s website overview of the battle. Rather than spend a lot of time on this post focusing on the history of the battle I want to focus instead on the dedication of the monument itself. The Fort Sanders Monument’s dedication in Feb. 1914 is contextually a part of a bigger effort to commemorate Confederates in East Tennessee. In Kelli B. Nelson’s essay “A Nobler Victory,” Nelson chronicles the actions of the United Daughters of the Confederacy (UDC) in the region. She states in her essay that at the turn of the 20th century, Union monuments and memorials dominated the commemorative landscape of East Tennessee. Nelson argues however, that as the UDC constructed monuments throughout the region, the UDC often tied those monuments to contemporary issues of the time and combined the “Lost Cause” with what one might call Americanism. In doing so, the UDC slanted the Civil War memory of a heavily Unionist area to the Confederate side while legitimizing the “Lose Cause” narrative of the Confederacy. 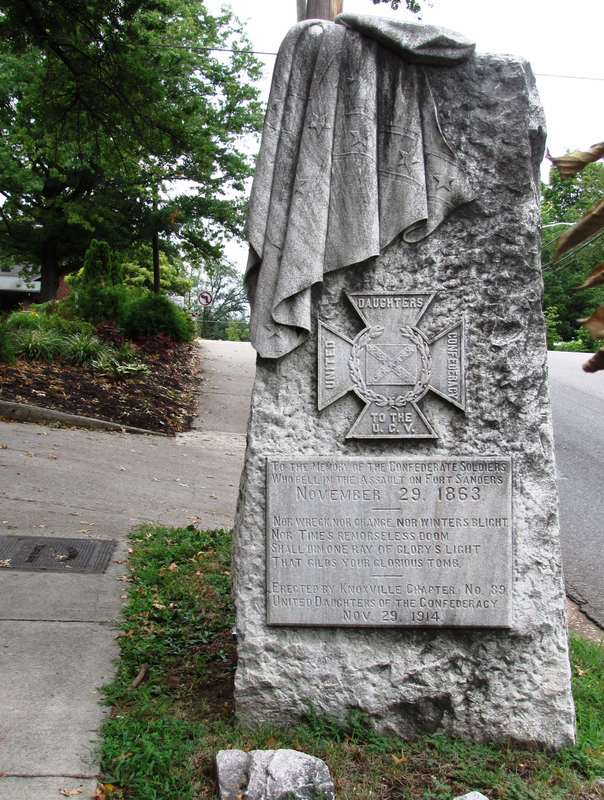 In 1914, the Knoxville UDC erected the Fort Sanders Monument. According to various newspaper accounts and UDC speakers and members, the monument dedication concentrated on brave Confederates who withstood the hardships of the war to fight for their rights. The historian of the local Sons of Confederate Veterans camp at that time, Wesley Kennerly, delivered the second address that day. In his speech Kennerly mentioned Burnsides’s use of local citizens and “several hundred slaves” in order to complete the fort. According to the philosophy of the “Lost Cause,” slavery was not the central cause of the Civil War. The image, painted by Kennerly of the Union using slaves to finish work, is used as evidence for the argument. The idea that slaves were an afterthought, or perhaps a symbol of division but not the cause, is argued heavily with such descriptors. Many of the speeches given in 1914 on the day of the Fort Sanders Monument dedication also referred to the Bethel Cemetery, where the Ladies Memorial Association erected a monument in 1892. According to Nelson’s thesis, On the Imperishable Face of Granite, the LMA did not publicly advertise the Bethel Cemetery or the monument erected there due to the region’s emphasis on Union Memory. In that narrative, the Fort Sanders monument represents a change in reverence over time. The UDC depicted Confederate soldiers at Fort Sanders, and throughout the South, as valiant men and boys that helped glorify the “Old South.” In 1914, East Tennesseans were more than willing to accept what some might call a southern progressive rhetoric of reconciliation and industrial development. Rather than deal with issues of racial inequality, much apparent in a segregated city during the era of Jim Crow, white progressives accepted the UDC’s image of racial stability and benevolence. I still maintain that every community should be responsible for its own commemorative landscape. As such, this debate is one Knoxville needs to have. The issue is that the debate needs to be honest and open. The monument is about history, yes, but something that is often overlooked is that monuments tell us a lot about the people that erected them. People currently flame warring on my Facebook feed about the Fort Sanders Monument, and its innocence in the accusation that the monuments represents white supremacy, spend too much time focused on the battle or the event and people commemorated. The dedication of the monument gives us an insight to what was happening in Knoxville and East Tennessee in 1914. The UDC was active in commemorating the war but also in crafting a political and social message during the era of Jim Crow. Each monument that they erected, became a story telling prop in this fabricated history known as the “Lost Cause.” I think if we seriously analyze the statements of many groups who call for the preservation of Confederate monuments, these props are still serving that storytelling purpose. Nelson, Kelli B. Tennessee Women: Their Lives and Time, Vol. II. ed. by Sarah Wilkerson-Beverly Bond. Nothing unusual. Burnside used them in Kentucky. Why not Tennessee? Typical. People usually don’t say bad things about who they are memorializing. -I don’t get any message of “white supremacy” out of this. It’s just a memorial to those who died in a war. I’ve lived in the South all my life. I’ve never heard anyone say that the monuments (any of them) were for white supremacy and/or “keeping blacks in their place.” It’s a fabrication of 2017 in order to motivate the removal or destruction of the monuments. I didn’t argue there was anything unusual, but it was a built in nuance to decentralize the importance of slavery as a cause of conflict. Indeed – can we agree that the resistance to critique who we memorialize places them on a pedestal whether appropriately or otherwise? I’m sure in the arsenal of arguments elsewhere you’ve accused people of doing this with A. Lincoln. This is called “racial colorblindness.” You should check it out. Instead of calling these monuments “Confederate” monuments, we should call them what they are, “Jim Crow” monuments. They were erected to further the cause of white supremacy which is what the Lost Cause was created to protect as well. The UDC in the first four decades of the 20th century went to great lengths to perpetuate both. If people want to honor the memory of traitors who committed treason against their nation in their struggle to protect slavery, that’s their business. If the monuments to these traitors does not say they were traitors or that they committed treason against the United States of America in the fight to protect slavery, then what exactly is being remembered? I continually run into people who say removing these monuments is erasing history. Yet, when asked to explain what history it is, they fall silent. It has far more to do with the continuing culture wars than actual history. When these same people are given the facts about the Civil War, they refuse to actually read the documents because the documents don’t fit into the narrative they have chosen to believe. Removing these monuments is not erasing history. It is removing the lie the monuments were erected to perpetuate. Country and duty are two important terms in 18th and 19th century American history. Country and nation were by no means synonymous. When the founding fathers spoke of their “country,” they were refereeing to their states, and neighboring states with common interests, e.g. MA and CT were both theocracies intertwined with the Congregational Clergy with colleges, Harvard and Yale supporting its agenda. Duty was a part of the hyper-masculine culture that believed it was a man’s responsibility to do whatever it took to protect ones property and family. As the government was new, it did not have a bureaucracy to manage a multiplicity of offices, nor the resources; it relied on its men and their beliefs in duty, honor and glory. When individuals fought for their country, they were not fighting for a specific agenda. Even our soldiers today do not fight for a specific cause -they fight for their country, the place they are from, their loved ones, and they believe that they are fighting an oppressive power. * * * Personally, I suspect the rally to take down the statues of confederate soldiers is driven by post-modern feminists that want to take down statues of men and replace them with statues of women believing that the abundance of male statues contributed to making women accept a secondary role in society. Too many feminists forget the high infant mortality rates and low birth rates at the turn of the twentieth century and that women too frequently died in labor before twentieth century health-care. Instead, post-modern feminists are blaming the statues. I’m sure you think so.